The annual International AIDS Conference represents the largest conference on any global health issue in the world. The theme of AIDS 2018, held in Amsterdam in July, was ‘Breaking Barriers, Building Bridges’, and brought together over 16,000 researchers, advocates, policy makers, funders and community leaders from more than 160 countries. See more at www.aids2018.org. Following on from this conference, Irish Aid, the Irish Forum for Global Health (IFGH), Concern Worldwide and the Royal College of Surgeons in Ireland are holding a follow-up event, bringing together health workers, patient advocates, and civil society to present their highlights of AIDS 2018 and the implications for the Irish and global response to the epidemic. The event takes place on Friday 5th October 2018, from 2pm to 5pm in the Houston Theatre, Royal College of Surgeons, 26 York Street, Dublin 2. This is a great opportunity to learn more about what happened at the conference and engage in a lively debate about HIV and AIDS. 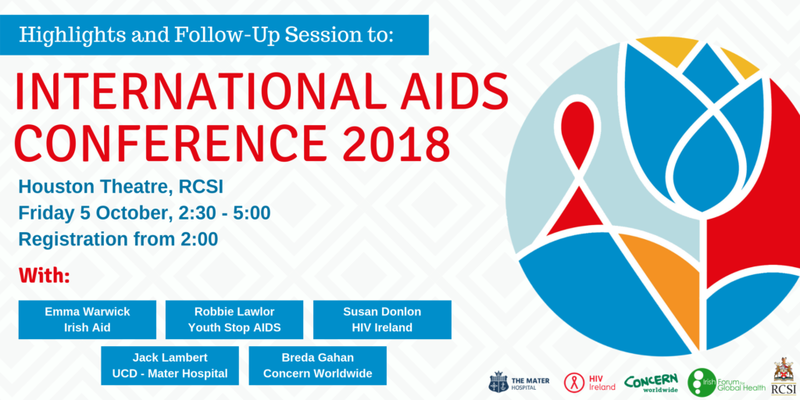 Speakers: Jack Lambert, UCD-Mater Hospital; Susan Donlon, HIV Ireland; Robbie Lawlor, Youth STOP AIDS; Breda Gahan, Concern Worldwide. Chaired by Emma Warwick, Irish Aid. Attendance at the event is free of charge, places are limited, and registration is essential. Register here. Refreshments will be available 2pm.